As fans of books, television, and movies, we believe in the power of story. Narratives can show us we’re not alone. They can introduce us to experiences and ideas that we would not otherwise know. In the Oscar-nominated documentary Life, Animated, we learn that amazingly story can give voice to a speechless boy and be a source of strength for a young man striking out on his own. When Owen Suskind was a toddler, he lost the ability to communicate. A rare joy for him was watching and re-watching Disney movies, and one day he responded to his dad with a line of dialogue from a favorite character. Elated, his parents found ways to interact with their son using Disney personalities and stories. 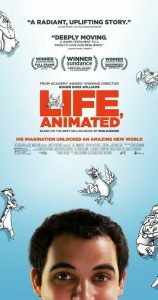 Life, Animated features a loving family, an exceptional young man, and a triumphant journey worthy of the stories Owen adores.